Accurate Reels, home of the patented Twindrag reels. Penn Reels, The Biggest Name in Fishing. Seeker Rods, Rods Made in the USA. G Loomis Rods, G. Loomis casting and spinning rods have become the standard against which all others are measured. Shimano prides itself on its ability to design and produce fishing tackle that features cutting edge technology such as High Efficiency Gearing (HEG), A-RB and TC4 Construction. Daiwa's emphasis has been upon innovation and quality. The result is a long list of product features, design and materials that have become standards for the fishing tackle industry. 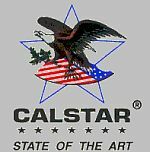 Calstar fishing rods and blanks have "set the standard" for serious saltwater anglers worldwide. Strength, durability, and performance to catch serious fish—Calstar! Avet Reels introduced a new line of saltwater reels destined to revolutionize the conventional reel market.